A couple of my friends are always complaining about whether or not they should wear long earrings with statement necklaces and how to wear multiple necklaces. Well, besides having to take up about 3 posts to demonstrate this in its entirety, let's take a look at one of my fav stylish celebs rocking this look........Sarah Jessica Parker. Notice the differing lenghts but pay attention to the common theme....chain links. The combination of beaded necklaces works well together in the look on the right. 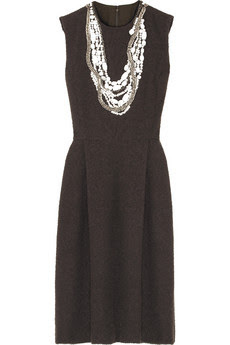 The key is to wear a plain colored dress when pairing different necklaces together. She has rocked this style for the past year and rocks it pretty well I must say. Well, for the girlie girl who's just a tad bit lazy and doesn't want to deal with rhinestones, pearls, and chains, try these built-in necklaces for a similar look.